Yorkshire actress Kate Anthony will be reunited with a couple of her ‘Coronation Street’ chums when she takes to the stage with Northern Broadsides in JB Priestley’s ‘When We Are Married’. Kate plays Clara Soppitt in the entertaining northern comedy which the Halifax theatre company is touring in a joint production with York Theatre Royal. The play opens in York from September 9 to 24 and ends a nationwide tour at the Viaduct Theatre, Dean Clough, Halifax, from November 29 to December 10. Kate, who played Pam Hobsworth in the ITV soap opera, will line up with Sue Devaney and Steve Huison, also from ‘Coronation Street’ as well as Adrian Hood from ‘Dinnerladies’. 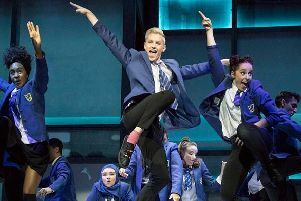 “It’s great to be back with Broadsides and playing a role previously portrayed by great actresses such as Peggy Mount and Maureen Lipman,” she said. Tel 01904 623568 for York Theatre Royal and 01422 255266 for the Viaduct.